NOAH’s Ark was in the shape of a pyramid, according to startling new revelations following a high-tech scan of the Dead Sea Scrolls. More than 50 years ago, a shepherd found seven scrolls in the Qumran Caves in the Judean desert of the West Bank near to the Dead Sea. The findings formed a larger manuscript which have been come to be known as the Dead Sea Scrolls. The papers contain Biblical and non-Biblical stories and have offered scientists a glimpse into the past and shed new light on Abrahamic religions. The latest discovery, which was found by scientists who scanned a piece of the Dead Sea Scrolls using different wavelengths of light at 28 times higher resolution than standard scans, revealed that Noah’s Ark was pyramid-shaped. Experts had been unable to read a word following the Hebrew phrase “the ark’s tallness” on the scrolls, but thanks to the high-tech scan, they have now discovered that the word is ‘ne’esefet’. 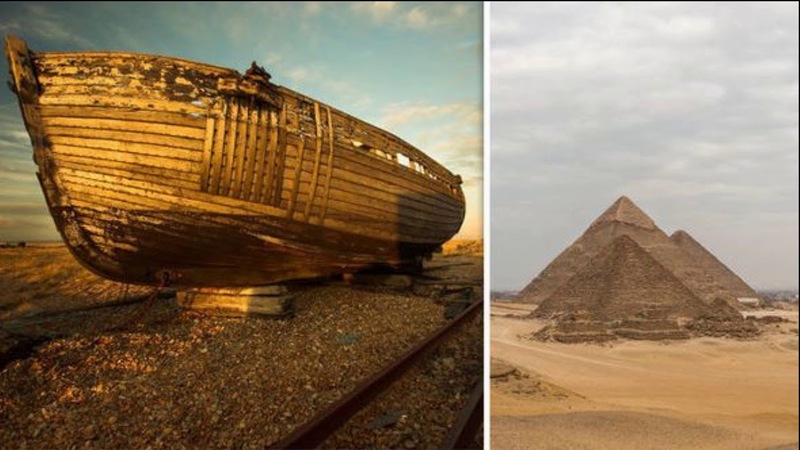 The translation of ne’esefet from Hebrew to English means “gathered”, which Dr Alexey Yuditsky from the Hebrew University of Jerusalem says means that the ark’s ribs were gathered at the top to form a shape of a pyramid and the discovery is actually backed up by previous findings. Dr Yuditsky says the Septuagint, which is a Greek translation of the Bible which dates back to the third century BC, also describes the ark’s shape as a pyramid, while medieval authors such as Maimonides also suggested the same. This discovery has led some to believe Noah, who escaped from ancient Egypt, was actually a pharaoh, as pyramids were a sign of high standing in the North African empire at the time. Blogger Jesse Waugh writes on his website: “Many ‘alternative’ historians now believe that Moses was Akhenaten, who escaped to Amarna with his people and his Queen Nefertiti, and where he set up a new society dedicated to the veneration of the monotheistic sun-god Aten.